Ambler is a borough in Montgomery County, Pennsylvania, in the United States. It is located approximately 16 miles (26 km) north of the city center of Philadelphia, Pennsylvania. The historical territory of the Lenni Lenape was in the Delaware River Valley, in an area reaching from Cape Henlopen, Delaware, northward towards the lower Hudson Valley in southern New York. The area towards the south, including what is now Philadelphia and nearby Ambler, was the home of a linguistic group called the Unami. According to tradition, the Lenape established a peace treaty in with Quaker William Penn in the 1680s. William and George Harmer are listed among the Quakers who emigrated to Pennsylvania in 1682. In 1716, William and George Harmer purchased a 408-acre tract from William Penn, an area including most of what now is Ambler Borough. They are credited as the first landholders to actually settle in the area. 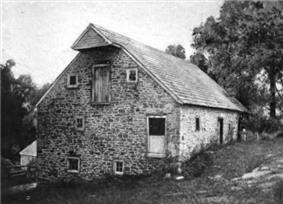 William Harmer built a grist mill powered by the Wissahickon Creek, "the first commercial venture in the Ambler area". He also built a stone dwelling with casement windows and diamond shaped leaded glass, near what is now the intersection of Butler Pike and Morris Road. After his death in 1731, the house, mill, and property were sold to Morris Morris and his wife Susanna Heath Morris. As of 1790, Jonathan Thomas purchased half an acre of land from Gilkinson and sited a tannery at the intersection, causing a nearby creek to be nicknamed "Tannery Run". 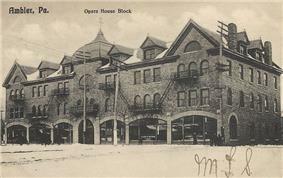 As of 1810, the tannery was sold by his son, David Thomas, to Joseph Rudder. As the "Rose Valley Tannery", it is mentioned as being one of the oldest in the county. It later became the property of Alvin Faust and the firm A. D. Faust Sons. In 1881, the Keasbey and Mattison Company, whose business included the manufacture of asbestos, moved to Ambler from Philadelphia. Ambler's location along the railroad line was a primary consideration in the location of Keasbey and Mattison Company in Ambler, as it meant that raw asbestos could be easily brought in from Quebec and finished products sent out to markets. Another consideration was the availability of magnesium carbonate, from local dolomite mines. The original K&M factory was built as of 1883. When the company arrived, the town consisted of "70 houses, 250 residents, a drug store, general store and a few other businesses." 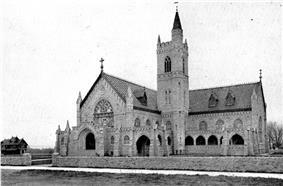 Keasbey and Mattison invested heavily in the town, bringing in Southern Italian stoneworkers to build 400 houses for workers and managers, as well as offices, an opera house, the Trinity Memorial Episcopal Church, and Mattison's personal estate, Lindenwold Castle. Many of the Italians stayed in Ambler, helping to form its cultural identity. Maida, Calabria is the town's sister city today. The company also employed African Americans, originally from West Virginia, in the less-desirable wet-processing areas of the asbestos plant. They tended to settle in west and south Ambler. By World War I, Ambler was known as the "asbestos capital of the world". However, the Great Depression took its toll, and the company was sold to an English concern, Turner & Newall (T&N), in 1934. The plant continued to operate under the K&M name. In England in 1924, doctors reported the first case of asbestosis, a chronic illness caused by the inhalation of asbestos fibers. By the 1950s, evidence linking asbestos to cancer was mounting. Richard Doll, an epidemiologist at Turner and Newall, reported (in spite of company pressure) that people exposed to asbestos for 20 or more years had a 10 times higher risk of developing lung cancer than the general population. Also, a formerly rare and almost always fatal cancer, mesothelioma, was reported in epidemic proportions near asbestos mines in South Africa. In the 1960s, the British Journal of Industrial Medicine indicated that simply living near an asbestos factory, or in an asbestos-insulated building, increased mesothelioma risk. Turner & Newall operated the factory until it closed in 1962, then sold the property to CertainTeed Corporation and Nicolet Industries. By 1973, the Environmental Protection Agency (EPA), began to restrict the use of asbestos, stopping the sale of insulation spray in 1973, and of solid asbestos insulation in 1975. Nicolet filed for bankruptcy in 1987. By 1989, most remaining products were banned, under the 1989 Asbestos Ban and Phaseout Rule. Although the Ban was struck down in 1991, few asbestos-based products remain in the domestic marketplace. Federal-Mogul, an American automotive supplier, purchased the remaining assets of Turner & Newall in 1998. As health concerns about asbestos became widely known, it too found itself in Chapter 11 bankruptcy due to asbestos liability. A 2011 study by the Pennsylvania Department of Health reviewed data from 1992 to 2008, and reported that mesothelioma was diagnosed 3.1 times more often in Ambler residents than in other Pennsylvania residents. The higher rates were attributed to previous asbestos exposure in the factories. In Ambler, where more than 1.5 million cubic yards of asbestos waste were discarded in a 25 acre area known as the "White Mountains", contamination remains an issue. From 1973 to 1993 the United States EPA oversaw remediation of the White Mountains, renamed the "Ambler Asbestos Piles". It was proposed to the National Priorities List (NPL) as a Superfund site on October 10, 1984 and formally added to the list as of June 10, 1986. Various remedies were completed as of August 30, 1993 and the site was consequently deleted from the National Priorities List on December 27, 1996, after remediation. The site is reviewed every five years by the EPA. Local government has made redevelopment of the sites a priority. A 2005 proposal for a 17-story condominium tower was withdrawn after community opposition to the project. One of the concerns was asbestos waste at the location. In 2009 the Environmental Protection Agency (EPA) designated the proposed development as part of a second Superfund site, the BoRit Asbestos Site. The site includes an asbestos waste pile, an 11-acre pond and a former park. The EPA estimated that it would complete the initial cleanup phase at the BoRit site as of 2015. In 2013, Heckendorn Shiles Architects and Summit Realty Advisers successfully converted the derelict factory and smokestack of the Keasbey & Mattison company into a LEED Platinum Certified multi-tenant office building, the Ambler Boiler House. The adaptive reuse project won support from the EPA’s Brownfields Program and the EnergyWorks program. The renovations cost $16 million, and have resulted in a building with substantial green features including a grey-water system, geothermal energy, solar panels and a reflective roof system, and high-efficiency glass. "REACH Ambler: From factory to the future in Ambler, Pennsylvania". REACH Ambler. ^ "Introduction to the Lenni Lenape, or Delaware Indians". Penn Treaty Museum. Retrieved 24 September 2015. ^ Newman, Andrew (2013). "Treaty of Shackamaxon". The Encyclopedia of Greater Philadelphia. Rutgers University. Retrieved 24 September 2015. ^ Myers, Albert Cook (1902). Quaker arrivals at Philadelphia, 1682-1750; being a list of certificates of removal received at Philadelphia monthly meeting of Friends,. Philadelphia: Ferris & Leach. pp. 5–6. Retrieved 24 September 2015. ^ a b c d "Ambler Open Space Plan". Montgomery County, PA. Ambler Borough. Retrieved 2006. ^ Bean, Theodore Weber (1884). History of Montgomery County, Pennsylvania. Philadelphia: Everts & Peck. pp. 1092–1093. ^ a b "The History of the Harmer-Morris-Detwiler-Zabriskie House". Retrieved 24 September 2015. ^ a b c d Quattrone, Frank D. (2004). Ambler. Portsmouth, NH: Arcadia. ^ a b c d e f Hough, Mary Paul Hallowell (1936). Early History of Ambler, 1682-1888. Ambler, PA: Harry Hellar Kelly. ^ a b Wiley, Samuel T. (1895). Biographical and portrait cyclopedia of Montgomery County, Pennsylvania : containing biographical sketches of prominent and representative citizens of the county, together with an introductory historical sketch. Philadelphia: Biographical Publishing Company. p. 571. Retrieved 25 September 2015. ^ a b "Mary Ambler and the Great Train Accident". The Borough of Ambler. Retrieved 25 September 2015. 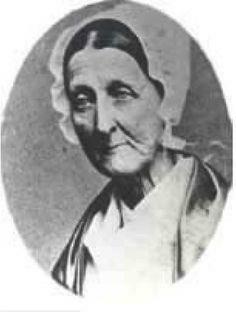 ^ "Mary Johnson Ambler". Find A Grave. Retrieved 25 September 2015. ^ "Mary Ambler: Heroine of the Great Train Wreck". 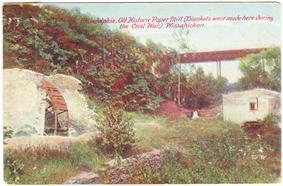 Historic Wissahickon Valley. Retrieved 25 September 2015. ^ Dougherty, Bernadette (June 25, 2013). 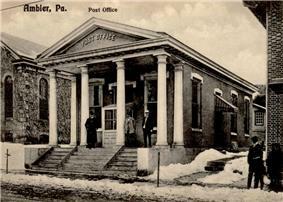 "Letter: Happy 125th birthday, Ambler!". Ambler Gazette. Retrieved 28 September 2015. ^ a b Kennedy, Joseph S. (September 5, 1999). "How A Physician Met A Pharmacist, Found A Fortune In Ambler Dr. Richard V. Mattison And Henry G. Keasbey Turned The Tiny Burg Into A Thriving Company Town". Philly.com. Retrieved 5 August 2015. ^ O'Hara, L. M. (2001). The town that asbestos built: The industrialization of Ambler, Pennsylvania (Honors Thesis). University Park, PA: Pennsylvania State University. ^ Toll, Jean Barth; Schwager, Michael J. (1983). Montgomery County, the second hundred years (1st ed.). 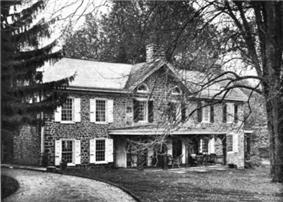 Norristown, PA: Montgomery County Federation of Historical Societies. 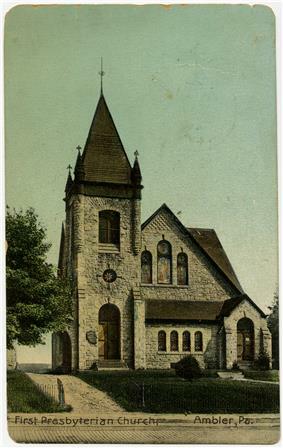 ^ "A History of Trinity Episcopal Church, Ambler: The first hundred years, 1898-1998" (PDF). Trinity Ambler. Retrieved 28 September 2015. ^ Conroy, Theresa; Price, Bill (June 17, 1986). "Fire Destroys Upper Dublin Church". Philadelphia Inquirer. Retrieved 28 September 2015. ^ a b c d e f g h i j k l Reiny, Samson (2015). "Living in the Town Asbestos Built". Distillations Magazine 1 (2): 26–35. Retrieved 5 August 2015. ^ Ciccarelli, Maura C. (August 23, 1987). "When Man's Home Really Was His Castle". Philly.com. Retrieved 5 August 2015. ^ "Ambler forms twinship with Maida, Italy". Retrieved 2012-12-30. ^ a b Burke, Richard (July 27, 1987). "A Bitter Legacy Left By Nicolet Asbestos Waste Stays In Ambler". Philadelphia Inquirer. Retrieved 7 August 2015. ^ Cooke WE (1924-07-26). "Fibrosis of the Lungs due to the Inhalation of Asbestos Dust". ^ "National Oil and Hazardous Substances Pollution Contingency Plan; National Priorities List" (PDF). Federal Register (U.S Government Printing Office) 61 (173). 5 September 1996. ^ "Federal-Mogul Completes T&N Acquisition". PR Newswire. March 6, 1998. Retrieved 25 September 2015. ^ "Federal-Mogul Corporation Files Voluntary Chapter 11 And Administration Petitions to Resolve Asbestos Claims". Federal Mogul Press Release. October 1, 2001. Retrieved 25 September 2015. ^ "REACH Ambler: From factory to the future in Ambler, Pennsylvania". REACH Ambler. ^ "Ambler Asbestos Piles". United States Environmental Protection Agency. Retrieved 29 September 2015. ^ "BoRit Asbestos Site". United States Environmental Protection Agency. Retrieved 28 September 2015. ^ Mercier, Dominic (March 29, 2013). "Generating New Life At The Ambler Boiler House". Hidden City Philadelphia. Retrieved 28 September 2015. ^ Moon, Robert C. (1908). The Morris family of Philadelphia; descendants of Anthony Morris, born 1654-1721 died 4. Philadelphia: R. C. Moon. pp. 156–157. ^ Kenna, Eileen (March 7, 1991). "Ambler Firm's Legacy Is Town's Victorian Jewels". Philadelphia Inquirer. Retrieved 25 September 2015. ^ Finarelli, Linda (April 28, 2015). "Lindenwold Castle anticipated centerpiece of development". Ambler Gazette. Retrieved 25 September 2015. ^ "Census of Population and Housing: Decennial Censuses". 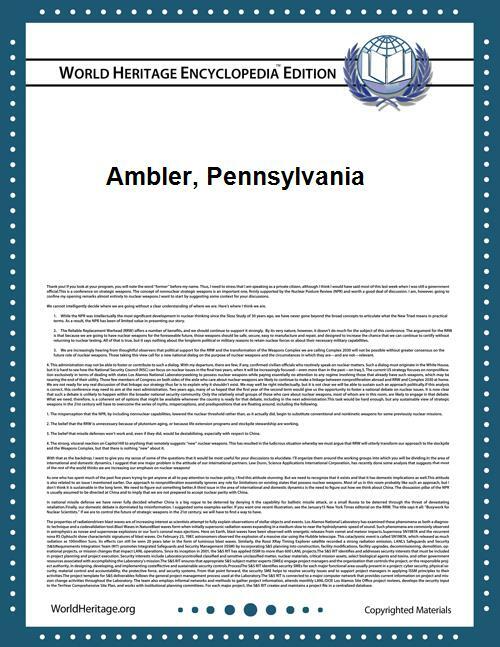 ^ "Ambler Borough Council". The Borough of Ambler. Retrieved 25 September 2015. ^ "Congressman Brendan F. Boyle". Congressman Brendan Boyle. Retrieved 26 September 2015. ^ "Mary Jo Daley". Pennsylvania House of Representatives. Retrieved 26 September 2015. ^ "Stewart J. Greenleaf". Retrieved 26 September 2015. ^ "District Background". Wissahickon School District. Retrieved 26 September 2015. ^ "Ambler Campus". Temple University. Retrieved 5 August 2015. ^ a b "History The Historic Ambler Campus". Temple University. Retrieved 26 September 2015. ^ Sokil, Dan (July 9, 2010). "Temple Ambler campus housing closes". The Reporter News. Retrieved 26 September 2015. ^ "Degree Programs". Ambler Campus. Temple University. Retrieved 26 September 2015. ^ "Our Mission". Act II Playhouse. Retrieved 26 September 2015. ^ "About". Ambler Symphony Orchestra. Retrieved 26 September 2015. ^ "History Since 1928". Ambler Theater, Inc. Retrieved 25 September 2015. Ambler is served by SEPTA's Lansdale-Doylestown rail line; Ambler station is a major park-and-ride facility on the line. SEPTA bus routes 94 and 95 also serve Ambler. Originally opened in 1927 as a Warner Brothers movie theater, the recently restored and renovated Ambler Theater is a non-profit, community owned movie theater that shows independent, art and limited-distribution films. Founded in 1951, the Ambler Symphony Orchestra currently performs several concerts per year under the musical direction of WRTI program director Jack Moore. Act II Playhouse is a 130-seat professional theatre founded in 1998. Act II has been nominated for 31 Barrymore Awards and has won six. Temple University, whose main campus is in nearby urban Philadelphia, has a suburban campus that is referred to as the Ambler Campus. The main contact address for the campus has an Ambler postal address, 580 Meetinghouse Road, Ambler, PA 19002. However, it is technically outside the borough limits, in Upper Dublin Township, and is in the purview of the Upper Dublin Township Police. Temple University Ambler was originally founded in 1910 as the Pennsylvania School of Horticulture for Women. It offers an array of undergraduate, graduate, and non-credit programs. The Borough of Ambler is served by the Wissahickon School District. In 2004, the Wissahickon School District had 4,535 students. Wissahickon School District has six schools: four elementary, one middle (grades 6-8) and one high school (grades 9-12). The median income for a household in the borough was $47,014, and the median income for a family was $51,235. Males had a median income of $40,305 versus $30,735 for females. The per capita income for the borough was $21,688. About 2.4% of families and 5.5% of the population were below the poverty line, including 6.8% of those under age 18 and 4.9% of those age 65 or over. In the borough the population was spread out with 23.5% under the age of 18, 7.0% from 18 to 24, 32.5% from 25 to 44, 19.7% from 45 to 64, and 17.4% who were 65 years of age or older. The median age was 37 years. For every 100 females there were 86.5 males. For every 100 females age 18 and over, there were 81.8 males. There were 2,510 households out of which 29.9% had children under the age of 18 living with them, 45.7% were married couples living together, 13.9% had a female householder with no husband present, and 36.3% were non-families. 30.2% of all households were made up of individuals and 11.2% had someone living alone who was 65 years of age or older. The average household size was 2.45 and the average family size was 3.08. As of the census of 2000, there were 6,426 people, 2,510 households, and 1,598 families residing in the borough. The population density was 7,605.8 people per square mile (2,953.7/km²). There were 2,605 housing units at an average density of 3,083.3 per square mile (1,197.4/km²). The racial makeup of the borough was 83.29% White, 12.03% African American, 0.25% Native American, 2.47% Asian, 0.06% Pacific Islander, 0.50% from other races, and 1.40% from two or more races. Hispanic or Latino of any race were 2.13% of the population. As of the 2010 census, the borough was 76.5% White, 12.8% Black or African American, 0.2% Native American, 3.8% Asian, 0.3% Native Hawaiian, and 3.4% were two or more races. 7.9% were of Hispanic or Latino ancestry, an almost four-fold increase since the 2000 census . According to the United States Census Bureau, the borough has a total area of 0.8 square miles (2.1 km2), all of it land. Ambler is located at (40.155099, -75.220160).